The classic cards based game, nobody ever really seems to get tired of them. Card games are ideal for a lot of situations whether that’s for sitting down for family time, something to do to pass the time or when it’s the more serious side of playing to win! We know which is the more gripping option and so do our friends at Instant win gaming also known as IWG. So, the team at IWG have got you covered with this tremendous online table game, a real reminder of how entertaining card games can be. It must be said that Instant Win Gaming have a knack for producing unique games for the online gaming market. They cover not only online table games however they also have online slot games, demonstrating their variety of production. IWG also supply win games to lotteries and a full design and build service. They specialise in taking interest in not one, but all aspects of online game development. With over ten years of experience in delivering high-quality products consistently through 3D, standard web browsers and HTML5, you can conclude that these guys really know their stuff and are maintaining to make their mark on the online gaming industry for the foreseeable future. 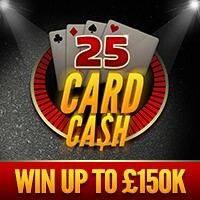 25 Card Cash is a brilliant example of this, a creative online table game that really emphasizes the push that IWG is making. 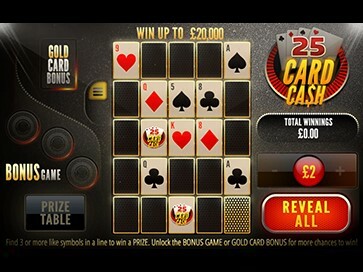 25 Card Cash is one of the simpler online casino games, in a few clicks of a button you may already win a fantastic prize. It really is that easy here on Easy Slots. As you enter the game you’ll need to choose your stake, then simply hit the play button which will start the game. You will be given 25 cards that are faced down. To reveal the cards, you must click on each one, in whichever order you prefer. Now the interesting part, to win a cash prize you must match 3,4 or 5 cards that resemble the same classic cards symbol. These can be matched in various ways such as diagonal, vertical or horizontal. You hold the power in this game so if you wish to reveal all your cards one by one you can do so, however, there is a ‘reveal all’ option if you want to speed things up, this will reveal all the cards that you have faced downwards. To qualify for the bonus round players, need to keep an eye out for 3 matching wheel symbol cards and this will trigger the bonus round. In this round every time you accumulate matching symbols, they will have bonus scores attached to them. In this round you have another incredible opportunity of winning, if you find the ‘gold card’ this will trigger an instant cash-out. To sum up this cracking creation by Instant Win Gaming, the three big things worth mentioning are Simple, Fun and Prizes. This game, in a nutshell, is a quick and effective way of winning cash, sound good?